To provide you with a better picture, who the people behind Freunde von Freunden are, we want to introduce you to our international team on a regular basis. Some of them have been with us even before the very start of FvF and others joined the crew along the road throughout our invigorating global adventures. Today we are happy to introduce photographer Olivia Rae James, who is based in the burgeoning cultural centre of Charleston. Together with Kristen Gehrmann she kicked off our network in the American South with shooting textile designer Harper Poe and the artist Hirona Matsuda. The charismatic lady preferably points her lens towards the beautiful details of the everyday life. Although her pictures look almost too perfect to be snapped spontaniously, they actually are. Olivia manages to regularly capture the perfect moment in the perfect picture, which she shares on her delightful blog Everyday Musings. She generally takes photographs during travels, at weddings, of delectable food, and authentic get-togethers previously published for example within the inspiring Kinfolk Magazine. The times she puts her camera aside, you will most likely catch her on an extended bike ride. Lighting candles, pouring a glass of wine, and making dinner for my boyfriend and I. It’s my happy place. Sunset bike rides around the peninsula are the best way to simultaneously unwind from the day and feel immense gratitude for this little city. Technology is such an integral part of my existence that I’m constantly reminding myself to step away and reconnect with reality. Although, something I love about technology is the fact that I can freelance from home all day and not feel completely isolated. Some friends and I rented a rooftop apartment in the Marais last year. We’d explore the city by day before buying ingredients at the market and heading home to make dinner. We’d drink wine and watch the tower sparkle from our roof. It was special. I just discovered Cody Foster & Co’s whimsical paper mâché animal head wall-mounts. Along with the rest of the world, I was really fired up about our recent election. My mom and I are making a trip to DC for Obama’s inauguration in January and I’m super excited to feel the energy of that day. My boyfriend and I recently had dinner at ‘The Walrus and Carpenter‘ in Seattle and ordered almost everything on the menu. Oysters on the half-shell, stunning crudo, cured trout, etc. Sprouted Kitchen, Rose & Crown, Industry of One. Max Wanger. I adore him and his wife Margaux — such genuine, inspiring people. 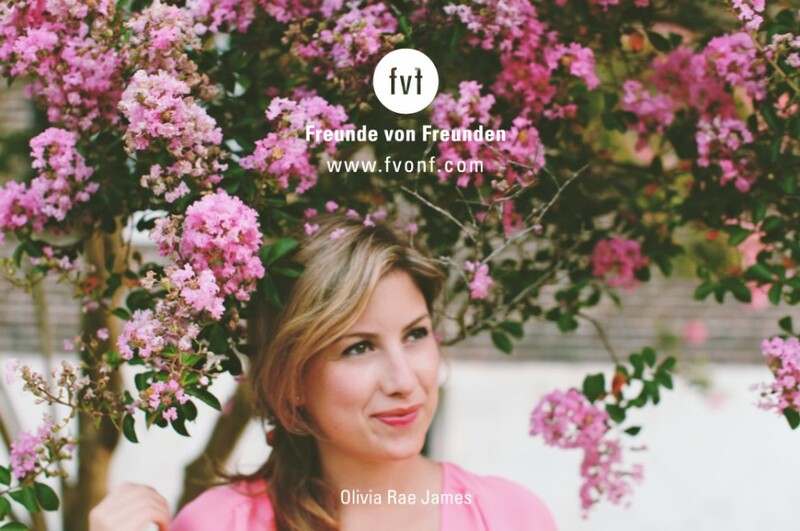 Thank you Olivia for being part of FvF! If you would like to check out more of her inspiring work, we recommend her website. As well, click here if you wish to see the portraits Olivia has done for FvF.